For some reason, though, half a package of no-boil lasagna noodles had me stumped. All spring and summer I’d look at them in irritation, wondering what I could possibly make besides a labor intensive half pan of lasagna, or some kind of lasagna roll-up that I felt would be more difficult than Pinterest made it out to be. 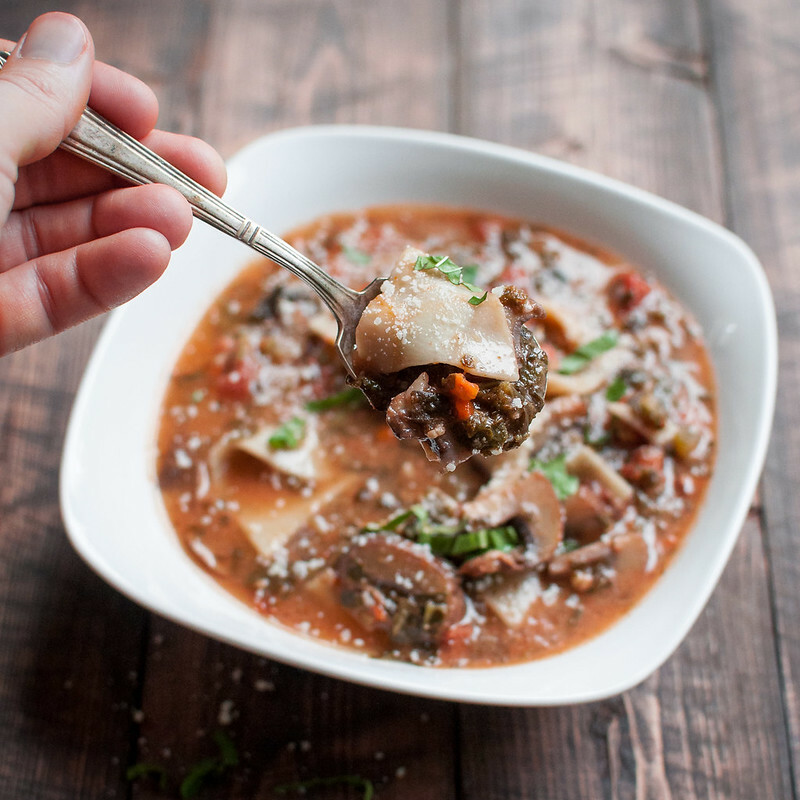 In a cross between sheer determination and fall inspiration, the idea came to put this lasagna soup on the weekly meal plan. A “deconstructed” lasagna of sorts, involving much less work, way fewer pans (one pan total, to be exact), and a significantly healthier, just-as-cozy fall supper. The soup’s flavor speaks for itself, so I did away with the fancy recipe name here. After all, how could I pick just one or two of the endless flavors to put in the name? And despite consistently producing lasagna-like flavors and textures, the recipe has plenty of room for improv. 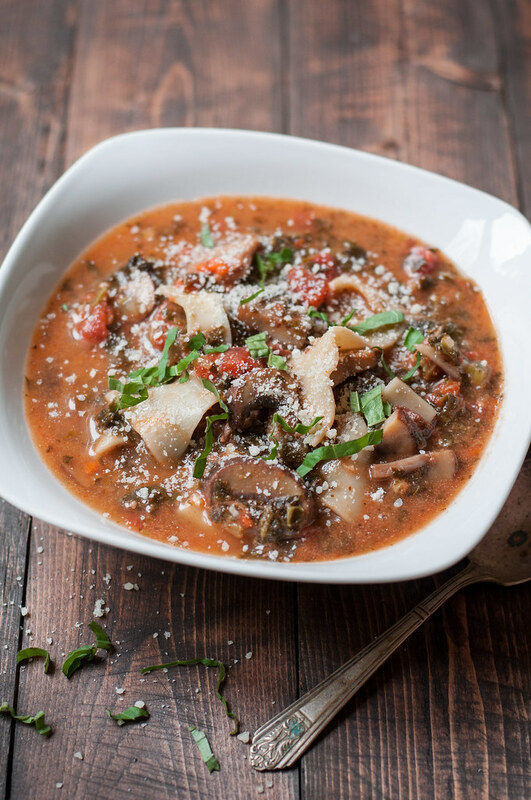 Add some sausage (and cut the mushrooms) for an omnivorous soup, or, do like I did and start the whole pot with some slow browned prosciutto (pregnancy meat cravings! )–a little goes a long way. Red wine in tomato sauces and soups is quickly becoming a favorite fall ingredient for me, even if it is because I can’t straight up drink a glass. To up the protein content without meat, white beans would be fantastic, but I left them out of the recipe since they’re not really a traditional lasagna ingredient. By far, THE best part of this soup is that, given the reduced quantity of carb-heavy noodles per serving, you don’t have to feel guilty for your garlic bread intake. "Lasagna deconstructed", this soup is a good way to use up a few leftover lasagna noodles or get lasagna texture in a lighter dish. It makes a huge batch: plenty to freeze for another dinner--just make sure you have a big pot! You can easily incorporate meat, like some Italian sausage, in addition to or in place of the mushrooms. Cook it in the soup pot first, remove to a bowl, then add back when the mushrooms are added back to the soup. Heat two tablespoons olive oil in a large pot over medium heat. Add carrots, celery, and onion and cook until almost softened. Add garlic, mushrooms, and rosemary, increase heat slightly and cook until all the liquid evaporates from the mushrooms, 5 to 10 minutes. Add tomato paste, increase heat to medium high, and cook until paste begins to caramelize and stick to the bottom of the pan. Pour in wine and cook for a minute or two, until very fragrant and wine has almost completely reduced. Add canned tomatoes with juice and all the stock or water and bring to a boil over high heat. Add a teaspoon of salt and the lasagna noodles, stir, and reduce to a rapid simmer. Cook until noodles are al dente, 5 to 10 minutes. Add spinach, reduce heat to medium, cover, and cook until spinach is wilted. Stir and reduce heat to low. Add parmesan and a generous splash of cream or half and half. Stir, cool slightly, taste, and season as needed. Serve with extra parmesan or fresh basil. Prep time assumes you're using mushrooms that came sliced. Add 5 to 10 minutes to clean and slice the mushrooms yourself. Note: This page contains affiliate links. It does NOT contain sponsored content. 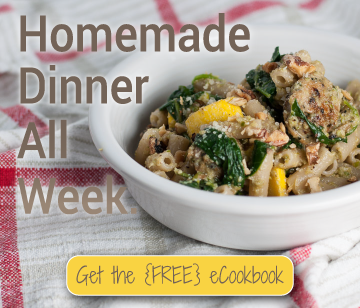 Affiliate links (to products I recommend, on Amazon) offset my ingredient and website maintenance costs, so I can keep bringing you lighter recipes like this one. Thanks!